Would you like to try a classic online slot game with exciting gameplay? 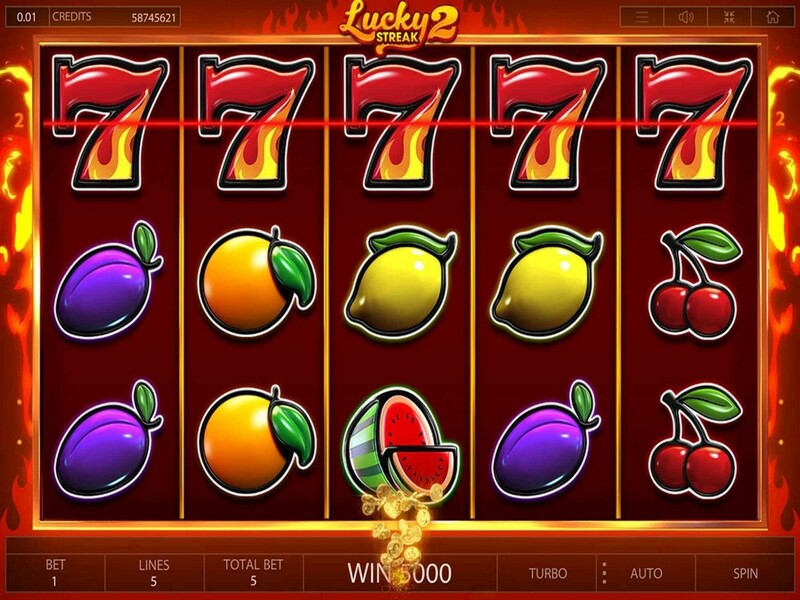 Lucky Streak 2 is an online slot game made by Endorphina that may give you what you are looking for. This game has nice graphics although some may say that it looks simple. The icons are shiny and the reels come in a specific red color. In the background, you will notice flames. Lucky Streak 2 is a classic slot with 5 reels and 5 paylines. There are seven basic symbols in this game including lemons, plums, oranges, cherries, grapes, watermelons, and red sevens. The latter is the most valuable symbol. You need three or more matching symbols to win a cash prize in this game. There is a yellow start too and this symbol acts as a Scatter (it pays on any reel). Lucky Streak 2 has a gamble feature which means that after every successful turn in this game, you will get an opportunity to play a card guessing game which will let you double or lose your last earning.